Never leave plants un-watered again with Aqua Globe!!!! 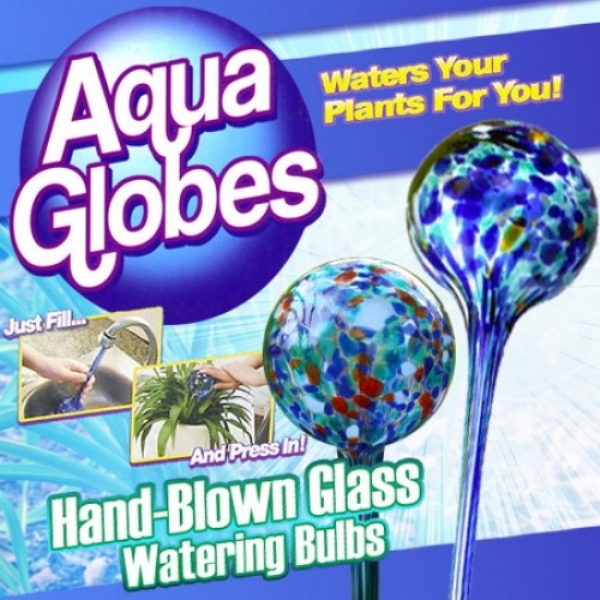 Never leave plants un-watered again with Aqua Globes: the hand-blown glass plant watering bulb! Aqua Globes as seen on TV waters plants efficiently for up to 2 weeks. Easy to use - just fill and insert into soil, and it waters plants as needed. Provides the exact amount of water needed every time! Comes in a set of two. Before I had the Aqua Globes I managed to kill three household plants that my husband had. When I got these in the I immediately went out to replace the plants I had killed and they lived!!! The watering levels are wonderful, never over watering as long as you don&apos;t push the globe all the way to the bottom (which you&apos;re not supposed to). The only thing is that they are made of blown glass which although is thick, is very fragile and makes me a little nervous to have in my plants where my cats tend to knock down. It would be nice if they made a similar product out of acrylic or plastic, although they wouldn&apos;t be as attractive. Work well as long as placed in the soil correctly for proper watering. Just keep an eye on the water level. I ALWAYS forget to water my plants. this handy gadget keeps my plants alive. Sometimes gets clogged with potting soil but that is just from pushing it into the dirt and with a sprayer cleans out fairly easy.